Mason jars aren’t only for canning and Bloody Mary’s, they also make the perfect gadget for making and storing salad dressings. And this one like most vinaigrettes will keep for weeks in the fridge, even with a bit of red wine. To your mason jar add a quarter cup of extra virgin olive oil, a couple tablespoons of both red wine vinegar and Dijon mustard, two teaspoons of red wine, a pinch of sugar, and salt and pepper to taste. Screw on the lid and shake vigorously for about ten seconds or until the dressing looks opaque. 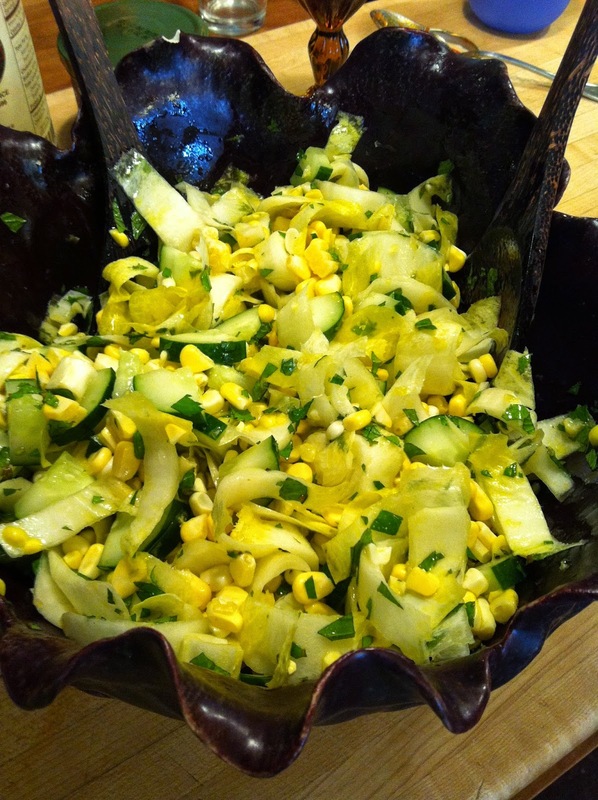 It will pretty much taste great on any salad including this endive, corn, cucumber, and scallion combination.